The weekend is almost over and I've been getting stuff ready for the week but I squeezed in time to make a quick card too. :) I've had this stamp set for awhile and have only ever used the little dragonfly from it. Something that I am trying to make more of an effort is making use of all of the stamps in a stamp set. Today I used the lightening bug. My kids love seeing lightening bugs and I remember seeing bunches of them out in fields when I was a kid so this was fun to make for me. For this card, I stamped out the little bug and colored him with my zig clean color markers. I didn't get very detailed with the coloring although I did go over it with a sparkle pen. Then I used a die to cut some dotted patterned paper out for his background. I glued the pattern paper down and used foam tape to prop the bug on top. 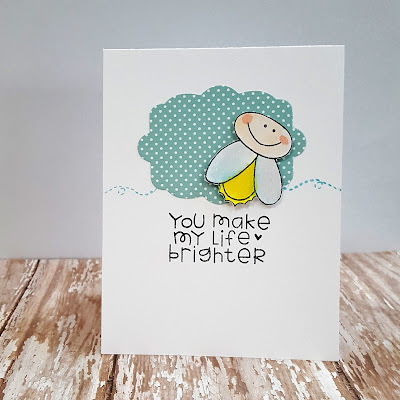 I stamped the sentiment underneath and added the little dotted lines on the side. Oh, Sheryl, how cute this design is?!!! Love your take on the sketch. Thank you for sharing your card with ATSM!